When we decided to visit Japan as well as Korea, there were a couple of things I knew I wanted to do in Japan. 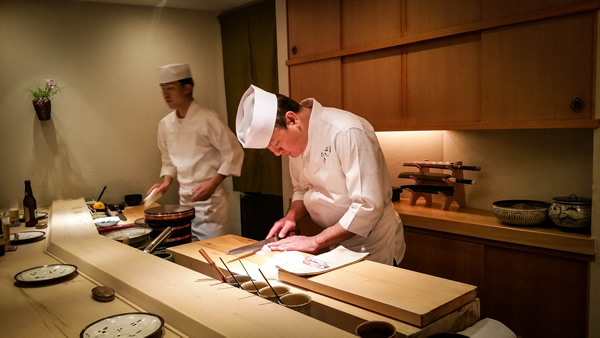 One was eating sushi at an amazing restaurant, the kind of experience you can only get in Tokyo, the home of the most Michelin Star restaurants in the world. (There are about a hundred 3 Michelin Star restaurants in the world; Tokyo has 12 and Los Angeles has none). I've never had dinner at a 3 Michelin Star restaurant, so that in itself was something I wanted to cross off my bucket list. Deciding which one was a little tough, since Tokyo has several sushi restaruants of this caliber, with Jiro being the most famous. 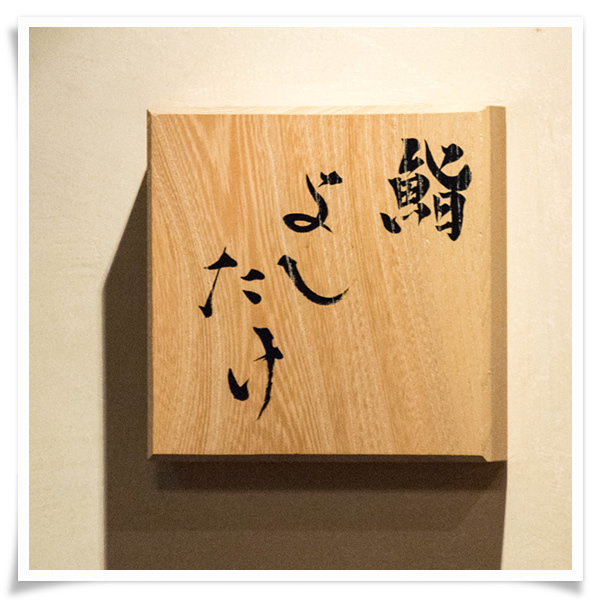 Although Jiro's restaurant was the one I considered for a little while, I decided against it for several reasons. I wanted a meal with some interaction with the chef, and I most certainly didn't want to be done with dinner in 40 minutes or less. Most importantly, I wanted to take pictures of my meal without being stressed! 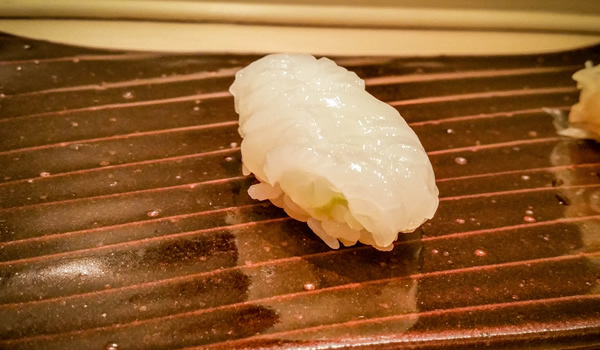 Sushi Yoshitake in Ginza, Tokyo, became my number one choice based on other reviews. Chef not only spoke english, he was known to be friendly. I could take my photos AND the food was supposed to be out of this world. I had to ask my brother who lives in Japan to make the reservation for us since they don't accept international requests. Either someone you know in Japan or your hotel concierge has to make the reservation for you. The day of our reservation, I was very excited to say the least. The restaurant is a little tough to find since it's on the 3rd floor of what looks like an office building, so give yourself enough time. Inside is rather small, and there are only 6 seats available. As soon as other diners arrived, we started on our dinner. 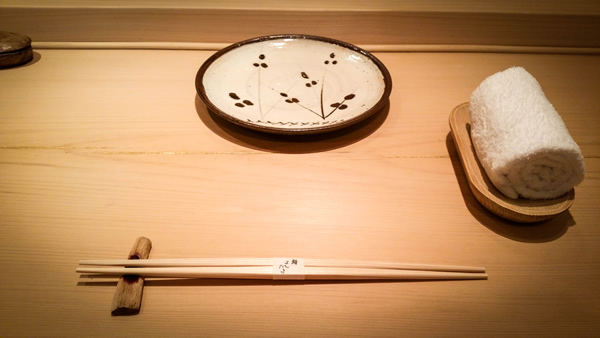 The meal at Sushi Yoshitake starts off with several tsumamis (little appetizers), before leading into traditional nigiri (sushi). 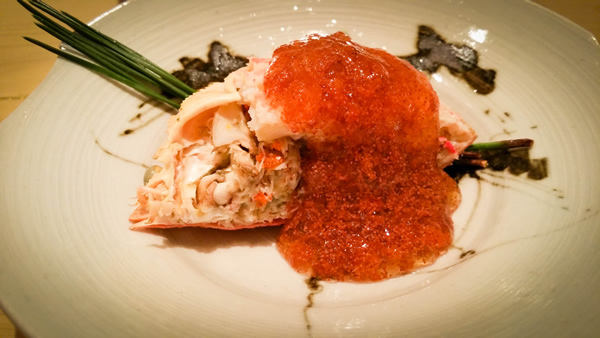 The first course was female salt crab with roe jelly. So brilliant to use roe in the sauce, texturally as well as for the flavor. This dish succeeded in whetting my appetite for the rest of the meal. Second dish was sashimi of rock fish. Next dish was one of my favorites of the night, octopus. I have NEVER had octopus that was so soft, buttery, and flavorful. Tasted like a piece of tender steak, not a chewy tentacle. Eating it was a revelation that something I was familiar with could be so different and exciting. Next tsumami was another taste explosion, abalone with sauce made from its liver. I love abalone, and the liver sauce elevated the dish to something exquisite. It was creamy, rich, and complex. When we were done with abalone, Chef added a little spoonful of rice in the sauce so we can mix it up and eat every last drop. Total foodgasm! 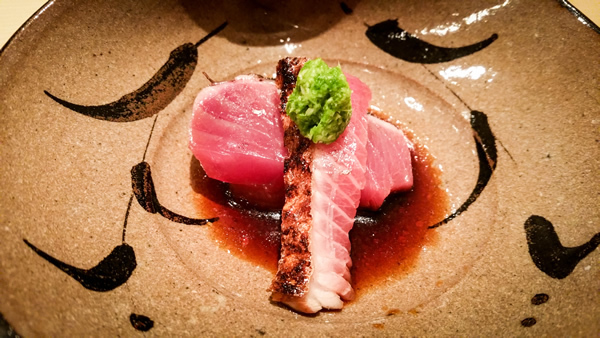 Next was the most beautiful bonito I had ever seen. I noticed he served us two pieces, one from the seared edge, and one from the meaty portion. It was topped with a little mound of green onion and a touch of ginger. Then we had the male snow crab with custard egg. 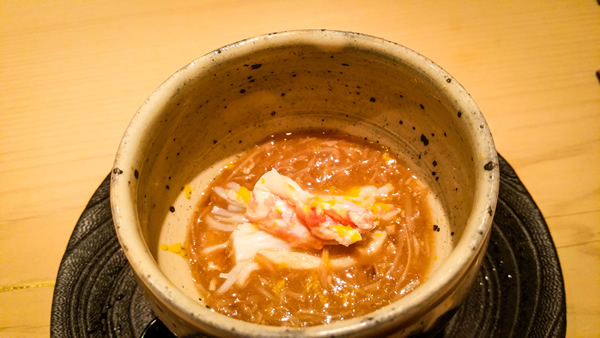 It was essentially crab atop its innards atop chawanmushi. 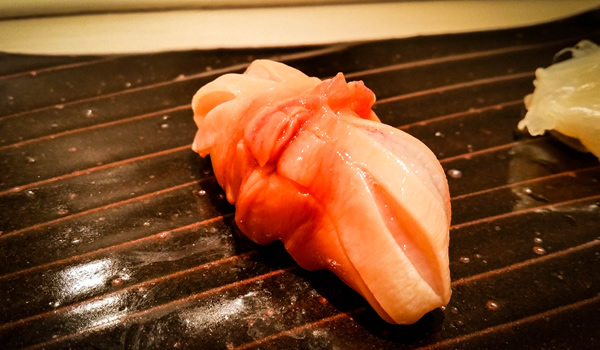 If I had to pick my absolute favorite of the night, it would be uni nigiri, but this comes close second. I've had uni many times, but this dish was not like anything I've ever had. When I dug into the dish, there were layers and layers of flavors. I could've had a huge bowl of this and called it a night. Then came the nigiris. 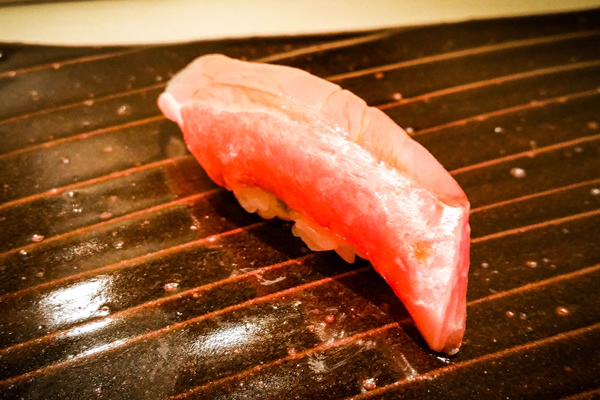 First was ika (squid), then kinmedai (golden eye snapper), and then chu-toro and o-toro. 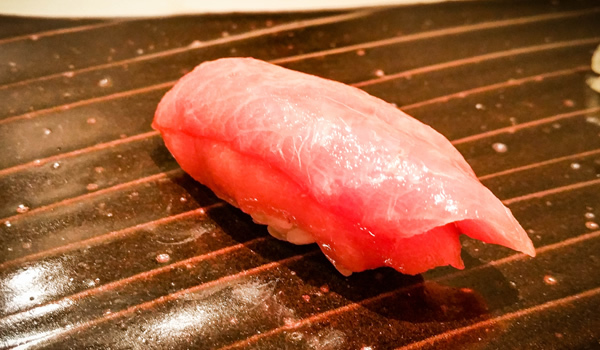 Toro was not too fatty, but perfectly rich and delicious. 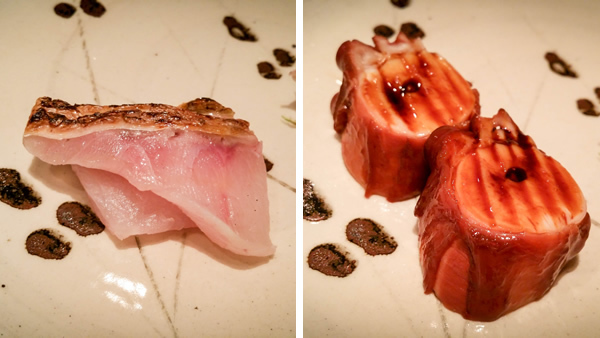 I think it would be an understatement for me to say that each nigiri surpassed my expectations for what a 3 Michelin star restaurant would serve. Aren't the colors just beautiful? It makes me sad that I can't have another meal here soon. Next was Kohada (gizzard shad). I wasn't familiar with this fish, but it was beautiful to look at and wonderful to experience. 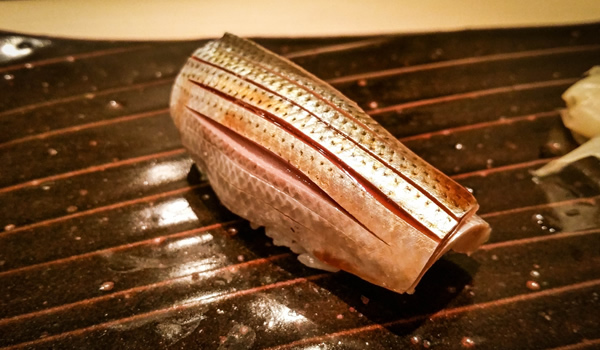 Kohada was followed by another silver skinned fish, saba (mackerel), served in a roll with rice. Both of the fish were fresh, tasted like the ocean, and every bit as wonderful to look at for its beautiful knifework as it was to eat. Aka gai (red clam) followed, which I found similar to mirugai (geoduck). Last group of sushi followed, led by my favorite nigiri of the whole night, uni (sea urchin). 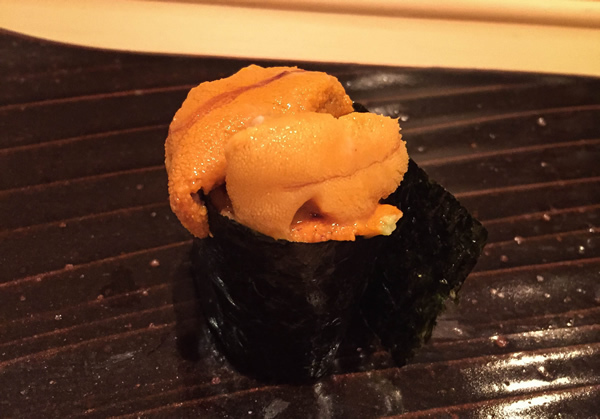 I adore uni, and I can honestly say that the uni at Sushi Yoshitake was the best I've ever had. Most of US uni comes from Santa Barbara, and I think it's wonderful, but the uni that was served at Sushi Yoshitake was from two different regions of Japan, Hokkaido and Murasaki. It was so creamy, so sweet, and so delicious that I wanted to weep with tears of joy. I was savoring every morsel in a state of pure bliss. 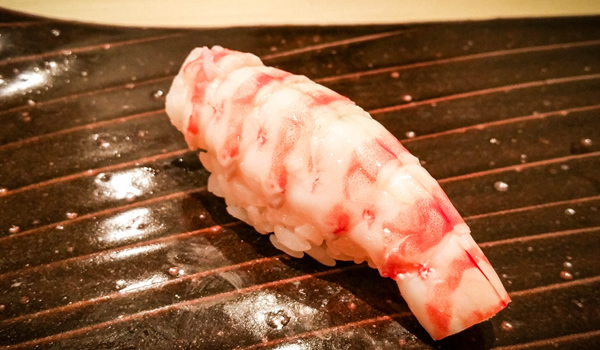 Next sushi was ebi (tiger prawn), and it was again another item that seemed to be common in Japan but not in the states. As you can imagine, it was the most delicious shrimp sushi, nothing like the wimpy shrimp sushi that is served in the States. 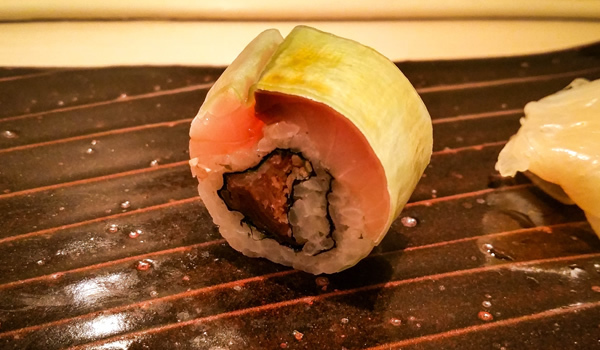 Next nigiri was unagi, one of my husband's favorites. 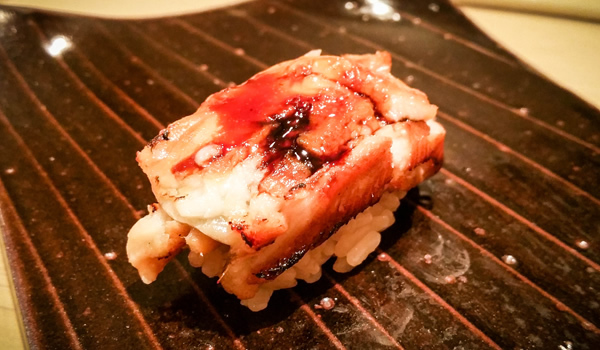 The unagi here was cooked with charcoal smoked seaweed, and it was a bit smoky, rich, and subtle. 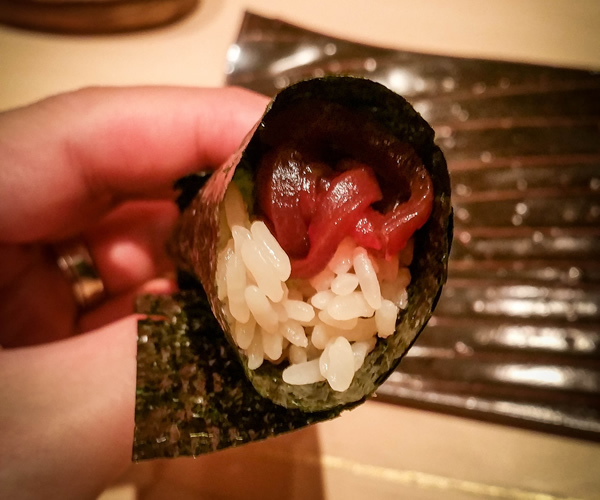 Lastly, we were given soy marinated tuna hand roll, and I realized we were coming to the conclusion of the most amazing sushi meal of my life. The ending of the dinner was tamago (egg), but it was unlike any tamago I've tasted. It was dense and sweet, more like a cheesecake or custard. It seemed that the Chef planned for a sweet ending to our dinner. 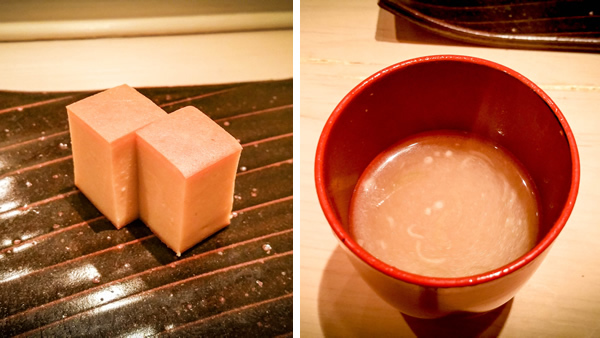 Finally, the most fragrant miso soup was served, and we had to wrap up our unforgettable dinner. 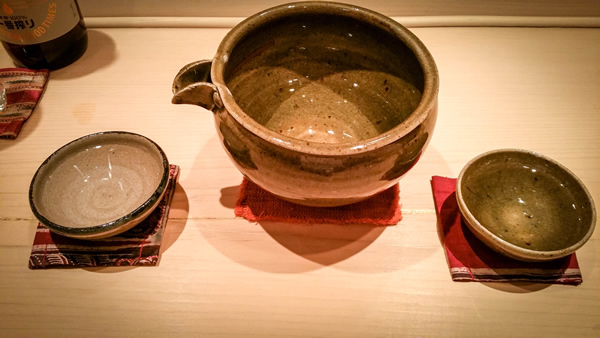 We finished our meal with some sake that was served in beautiful earthenware. People have asked me since whether the 3 Michelin Star restaurant lived up to its hype and if it was as good as I expected. 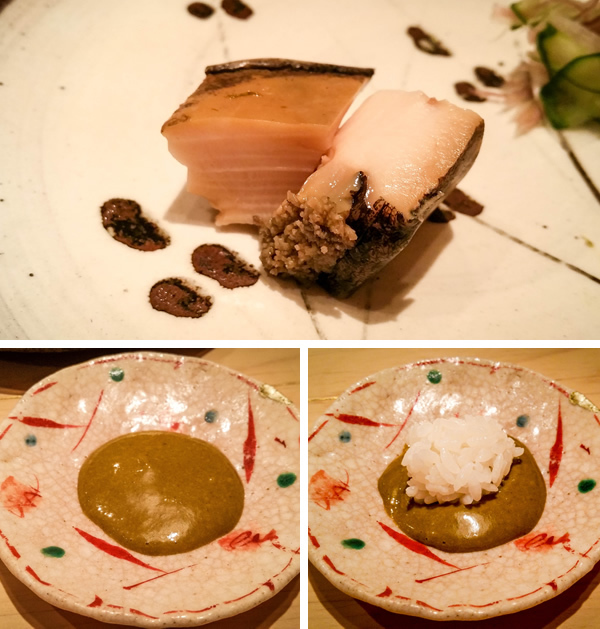 I can only say that the meal was wonderful from beginning to end, with attention paid to every detail, and the fish was the freshest I've ever had. Knifework was amazing, and the rice was cooked perfect. I don't think I can summarize my dinner at Sushi Yoshitake with just my one visit. A restaurant so complex, so intricate, I'd have to dine there several more times to give it a fair assessment. 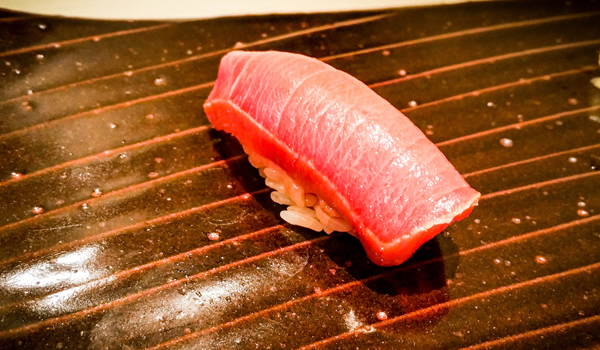 I know most people think great sushi is just fresh fish, but that is just a part of it. 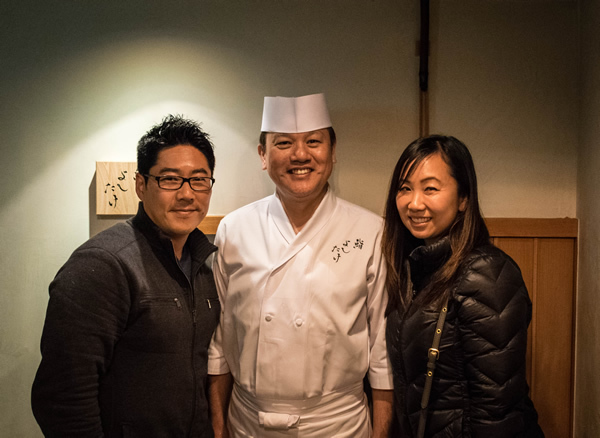 The perfectly cooked and seasoned rice, amazing knifework, and the creative genius behind every course all combined to provide the most perfect sushi dinner. I highly recommend this place if you have the chance to come to Tokyo. From beginning to end, it will delight and surprise you. Perfect culinary experience! The chef was gracious enough to take a photo with us when we were done. Please excuse how I look, since we were walking around all day in rainy Tokyo before our dinner. Hopefully I'll be back one day!